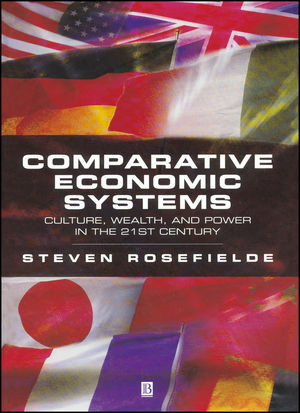 Comparative Economic Systems: Culture, Wealth and Power in the 21st Century explains how culture, in various guises, modifies the standard rules of economic engagement, creating systems that differ markedly from those predicted by the theory of general market competition. This analysis is grounded in established principles, but also assumes that individual utility seeking may be culturally determined, that political goals may take precedence over public well being, and that business misconduct may be socially detrimental. Steven Rosefielde is Professor of Economics at the University of North Carolina and a member of the Russian Academy of Natural Sciences. He is actively involved in economic systems and global security research with the American, Russian, Swedish, and Japanese governments. He is the author of five books, and over 150 articles published in periodicals such as the Wall Street Journal, Slavic Review, Journal of Comparative Economics, Europe-Asia Studies, European Economic Review, and the American Economic Review. 3. Culture, Politics and Ethics. Part II: Perfect Economic Mechanisms. Uniquely blends an appreciation of the merits of free enterprise with the recognition that no nation fully adheres to its structures. Explains why nations choose different economic systems, how they actually work, and should be optionally managed. Provides a primer for students of international relations interested in the economic foundations of security. Includes data on the comparative economic performance of 174 countries, which shows how differences in systems potential affect the pattern of global economic behaviors.